In this Whitemane Build Guide, we provide an overview of her strengths, abilities, talents and matchups. Whitemane is a complex and challenging Support Hero that falls somewhere between Deckard Cain, and Uther. I have to admit it took me a considerable amount of matches to feel comfortable on her, as her mechanic - Desperation - is challenging to master. 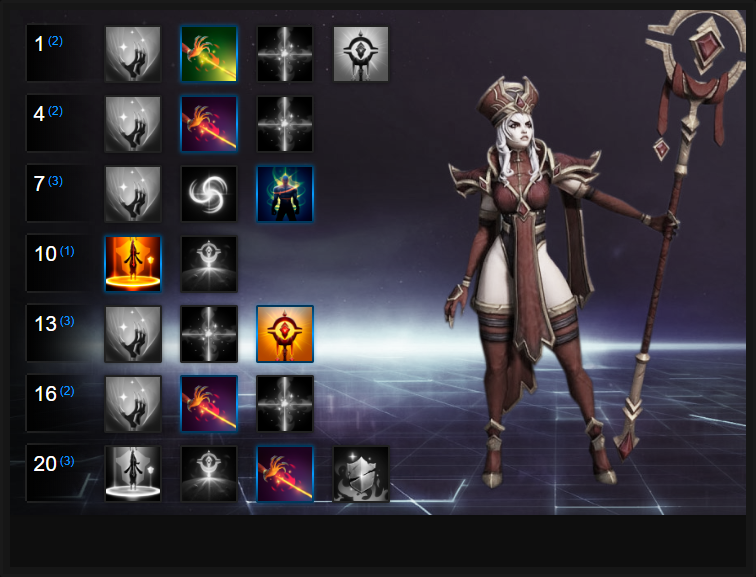 Unlike other Support Heroes, Whitemane only has mana costs on her only heal (Desperate Plea). Her other abilities simply provide utility, crowd control, or damage, while triggering the passive heal of her Trait, once Desperate Plea) is applied. What's interesting about Whitemane, besides her lack of mana costs on her other abilities, is the fact Desperate Plea has a stacking mana cost. The more she uses Desperate Plea, the more Desperation she obtains, which subsequently increases her mana costs even more. Balancing your Desperation, letting it expire, recovering mana and then using your other abilities is key to maximizing her sustain and control. Unfortunately for Whitemane, not only is this challenging, but she also has to take careful consideration of her positioning, as well as her damage: she can be killed incredibly quickly. Zeal (Trait) - There's two things to note about Zeal. Firstly, it's a buff that's applied to allied Heroes when you use Desperate Plea. In addition, anyone with Desperate Plea receives additional healing while the buff is active, based on the damage Whitemane deals. With Zeal lasting for 8 seconds, the Desperation debuff Desperate Plea causes lasting only 4, you can comfortably juggle 1 heal on an ally for very little mana cost. Only when you want to maintain Zeal on multiple targets - at a cost of back-to-back casts of Desperate Plea, do things become expensive (and challenging). Desperate Plea (Q) - Whitemane's only heal outside of her passive healing (when dealing damage, when Zeal is active), Desperate Plea has no cooldown, and a low mana cost. The downside is that when you cast Desperate Plea once, you'll receive a debuff (known as Desperation). Casting Desperate Plea a second, or third time, will increase the mana cost of the ability significantly, resulting in Whitemane pretty much depleting all her mana on a third cast. Staggering your use of the ability, so that your debuff expires before your second (or third cast) ensures Whitemane can manage her mana pool effectively - while still keeping her team alive. It's also important to note that Desperate Plea is the only ability she has - outside of Talents - which can apply Zeal. Without Zeal, Whitemane's Trait of healing allies through her damage, is redundant. Inquisition (W) - Causing Whitemane to channel the ability, and remain stationary, Inquisition slows any target caught in the beam, and deals damage over time (at a quick pace). With a fairly long range, Inquisition returns a high amount of health to any ally under the effects of Zeal, while also providing Whitemane with her only crowd control. Just be conscious of the fact Inquisition can be interrupted (with a long cooldown), so it's often best to use it when you're in a safe position, and to lock-down a Hero who your team are focusing, ideally when you have Zeal active (on one or more allies). Searing Lash (E) - The damage on Searing Lash honestly isn't great, but if you manage to trigger the first strike - and then have the second hit a group of enemy Heroes, the health return on any ally with Zeal can be solid. Dealing 180 damage at level 20 (twice), the bonus healing to anyone under the effects of Zeal can ensure you don't have to constantly rely on Desperate Plea for burst healing. Scarlet Aegis (R) - Without doubt her strongest Heroic, Scarlet Aegis provides a solid AOE heal and a considerable amount of armor for 4 seconds. In a team-fight, this is often a game-changer, and ensures Whitemane can not only heal her team in a pinch, but also mitigate a significant amount of incoming damage. With a low cooldown, just be conscious of the fact it has a small radius, so you'll often need to be in amongst your team to maximize its value. Divine Reckoning (R) - Her aggressive Heroic, Divine Reckoning is a damage over time ability that can be cast from a reasonable distance. Capable of dealing solid damage (though the likes of Malfurion or Lucio can mitigate a large amount of it), its primary value - I've found - is to heal multiple teammates quickly, when they have Zeal active. If they do, as long as the enemy team are suffering damage, your team will receive rapid healing over time. While Scarlet Aegis is the safer option, I still think Divine Reckoning is solid. Allowing Whitemane to cast Inquisition on an ally of her choice, Clemency deals rapid single-target healing but prevents Whitemane from then using Inquisition on an enemy (this Talent and the ability share the same cooldown). For providing Whitemane the ability to heal, without causing Desperation however, it's fantastic. Building on your Inquisition, High Inquisitor removes Desperation stacks when casting the ability, removing all stacks and restoring 60 mana for each removed. This Talent ensures that if you do have to rapidly cast multiple Desperate Plea's, that you don't lose any additional mana (only that of the original cast). High Inquisitor offers Whitemane amazing sustain. It's also worth noting that using Clemency (above) also clears the Desperation stacks, and restores the anticipated mana. Intercession provides an early Unstoppable on a 60 second cooldown. The only downside is that it causes 1 stack of Desperation. Thankfully, with High Inquisitor, you can quickly clear this simply by casting Inquisition straight afterwards. Scarlet Aegis is just brilliant. 40 armor is amazing mitigation, the healing is fantastic and its cooldown is short. It's a no-brainer. Whether playing aggressively or defensively, Guiding Light and its 20% movement speed buff, when Zeal is applied, ensures that allied Heroes can dive quickly, or escape easily. It's amazing for front-line Heroes, and even better when needing to retreat (especially if you have the mana to cast Desperate Plea across your team). Variable: If you're after self-sustain, grab Self-Righteous. It's a simple Talent that allows Whitemane to heal herself when she casts Desperate Plea on an ally. Causing Inquisition to become an AOE attack, Shared Punishment allows the ability to affect all those near your primary target. The damage is solid, the healing return for those under the effects of Zeal fantastic, and best of all - it's some extra damage for your team across multiple targets. Combined with Shared Punishment, Subjugation reduces the damage of targets affected by 75%. Considering the AOE size of Shared Punishment, Inquisition can debuff multiple enemy Heroes, shutting down the vast majority of damage they deal. It's ridiculously strong when cast at the right time. These Hero Threat Levels (1 being lowest threat and 10 being highest threat) are to help you determine which enemy Heroes can give you a headache. For the Heroes listed here, take extra care as they're particularly dangerous for Whitemane. This list of tips and tricks are just a handful of things we think will help your Whitemane play. We'll continue to add to the list as required and if you have any tips you'd like to share, let us know in the comments below and we'll place them here. 1. Remember that your Trait can only be activated through using Divine Plea. It has no other use, other than converting the damage you deal to health on an ally with the buff. 2. Zeal lasts for 8 seconds, while the debuff you gain (Desperation) when casting Desperate Plea (to apply Zeal) lasts only 4. 3. If you multi-cast Desperate Plea, Whitemane's mana bar will predict the mana she'll lose upon the expiration of Desperation. Unless you have Talents to clear this loss, you'll take the mana hit after 4 seconds. 4. Whitemane has very low mana costs if she only casts Desperate Plea once, before letting Desperation expire. All her other abilies have no mana costs. 5. Remember that casting Desperate Plea 3 times will drain 60 + 60 + 60 mana, plus your original mana cost for the first cast. 6. When you obtain level High Inquisitor at level 4, you can afford to spread Zeal liberally. The fact Inquisition removes all stacks of Desperation (while refunding 60 mana) gives Whitemane insane sustain. 7. Try to use Inquisition when you have an active Zeal (or two) as its damage output is high, for a quick return of health to those affected. 8. Only cast Inquisition if you can fully channel it. It doesn't have a mana cost, but does have a lengthy cooldown. 9. Outside of Talents, Inquisition is your only form of crowd control, but it won't help you if you're being dived: positioning yourself correctly will. 10. Without hitting a Hero with Searing Lash, its second cross of damage won't trigger. Try to take into consideration the minor delay before it scorches the earth to ensure you hit someone. 11. Scarlet Aegis only has a 1 minute cooldown. Don't be afraid to use it often: it'll turn most team fights in your favor.